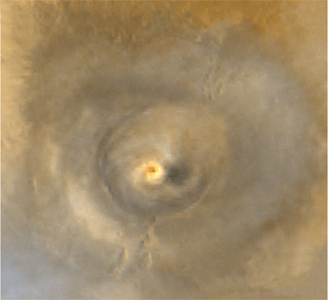 Three wide angle views taken by the Mars Orbiter Camera on NASA's Mars Global Surveyor at intervals approximately one Mars year apart show similar spiral dust clouds over a volcano named Arsia Mons. The upper-left image (figure 1) was taken on June 19, 2001, the first day of southern winter on Mars. The upper-right image (figure 2) was taken on April 24, 2003, in late southern autumn on Mars. The lower image was taken on Feb. 25, 2005, slightly earlier in late southern autumn on Mars. Some parts of Mars experience weather phenomena that repeat each year at about the same time. In some regions, the repeated event may be a dust storm that appears every year, like clockwork, in such a way that we can only wish the weather were so predictable on Earth. One of the repeated weather phenomena occurs each year near the start of southern winter over Arsia Mons, which is located near 9 degrees south latitude, 121 degrees west longitude. Just before southern winter begins, sunlight warms the air on the slopes of the volcano. This air rises, bringing small amounts of dust with it. Eventually, the rising air converges over the volcano's caldera, the large, circular depression at its summit. 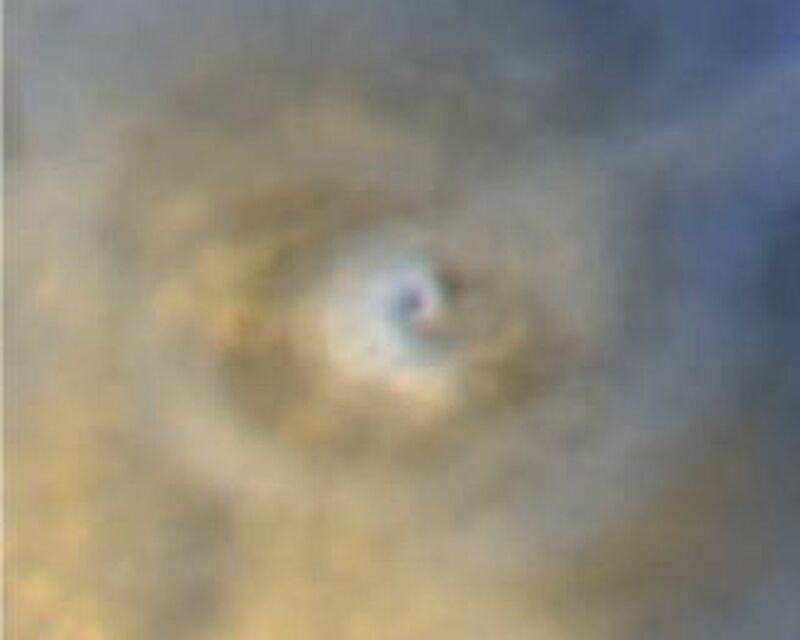 The fine sediment blown up from the volcano's slopes coalesces into a spiraling cloud of dust that is thick enough to actually observe from orbit. 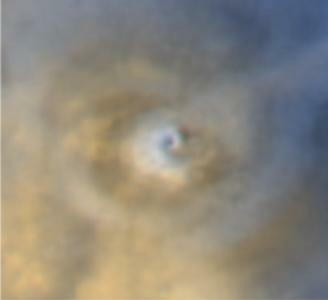 The spiral dust cloud over Arsia Mons repeats each year, but observations and computer calculations indicate it can only form during a short period of time each year. Similar spiral clouds have not been seen over the other large Tharsis volcanoes, but other types of clouds have been seen. The spiral dust cloud over Arsia Mons can tower 15 to 30 kilometers (9 to 19 miles) above the volcano.  The white and bluish areas in the images are thin clouds of water ice. In the 2005 case, more water ice was present than in the previous years at the time the pictures were obtained. 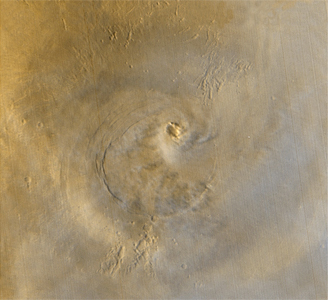 For scale, the caldera of Arsia Mons is about 110 kilometers (68 miles) across, and the summit of the volcano stands about 10 kilometers (6 miles) above its surrounding plains.